I love to serve this simple and fresh salad alongside my Famous Grilled Salmon recipe. They go together like peas and carrots. Add the lemon juice, extra virgin olive oil, salt, and pepper to a salad bowl, whisking to comine. Place the arugula in the bowl and with clean hands, toss into the dressing until it had coated the arugula. 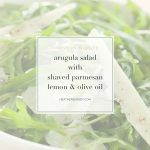 Toss the shaved Parmesan cheese on top of the salad. Serve immediately.